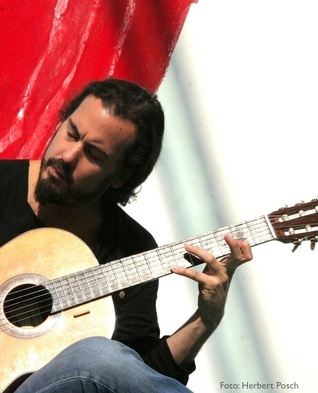 Argentinean composer and guitar virtuoso Diego Muné performs with both passion and complexity. He grew up playing contemporary new music, classical music, Argentinean folk music, blues, jazz and other stiles. He started to develop special resonances on the guitar when he was a little child, so he found his very characteristic way of playing and developed a wide spectrum of different sounds. The warmness of his music makes it intense and expressive. Touching and full of energy he creates flowing phrases, moving melodies and pulsating rhythm in quick succession, endlessly surprising with his inspiring innovations. He performs a variety of stiles both solo and in several formations. He has performed for example with Clementine Gasser, Maggie Nicols, Otto Lechner, Paul Rogers, Helmut Neugebauer, Peter Herbert, Franz Hautzinger, Ferdinand Schmatz and Michael Fischer. Diego Muné played concerts in France (Paris, Bordeaux, Bormes de Mimosas), Great Britain (London, Cheltenham), Italy (Rome, Pisa, Brescia, Turin, Genoa, Nettuno, Anzio, San Giorgio del Sannio, Bogliasco, Monteggiori, Latina, Anzio, Fasano, Noci - Puglia, Palazzolo - Sicily, Camaiore - Tuscany), USA (New York City, Hudson - New York, Boston, Chicago, Cleveland - Ohio, Grand Rapids - Michigan, Lafayette - Indiana, Iowa City, Omaha - Nebraska, Denver - Colorado, Wanship/ Tollgate Canyon - Utah, Phoenix, Flagstaff, Tucson, Oakland, Los Angeles, Santa Clarita, San Diego - California), Switzerland (Zurich, Basel, Biel, Bern), Czech Republic (Prague, Olomouc), Hungary (Budapest, Debrecen), Austria (Vienna, Salzburg, Linz, Ried im Innkreis, Graz), Germany (Munich, Ulm), Mexico (Tijuana, Mexico City), Canada (Montreal), Hong Kong, China (Shanghai, Beijing), Japan (Tokyo, Hakodate), Australia (Sydney, Melbourne, Hobart - Tasmania), New Zealand (Christchurch, Wellington, Auckland), Argentina (San Lorenzo, Buenos Aires) et al., at Schloss Schoenbrunn, Austrian National Library, Central Library, Votivkirche, Otto-Wagner-Kirche, Ruprechtskirche, Konzerthaus, ORF RadioKulturhaus, Museumsquartier, Leopold Museum, Alte Schmiede, Porgy & Bess and Japanese Embassy in Vienna, Ars Electronica Center in Linz, Stadtmuseum Munich, Museum of Modern Art in Olomouc, Belvedere Nettuno, Villa Adele Museo Archeologico in Anzio, Museo d'Arte Contemporanea di Villa Croce in Genoa, Museo Contemporaneo in Latina, No Nation Gallery in Chicago, Hong Kong Arts Centre, MONA Museum of Old and New Art in Tasmania, Testing Grounds in Melbourne, The Arts Centre of Christchurch, University of Vienna, University of Applied Sciences and Arts Northwestern Switzerland/ Music in Basel, University of Gloucestershire in Cheltenham and many other venues. He has played on more than 500 CD productions, recorded music for several films and took part in different kinds of multidisciplinary projects. He was the musical director of the film "El Gran Vuelo", which won prizes of SomCinema, Malaga Film Festival, Alcances, CIMA, AICE, Feroz Puerta Oscura, Sole Luna and others. Diego Muné is also working in scientific research projects. He collaborated with one of the biggest research centers: the CNR Pisa in Italy, where a team of doctors studied his solo concerts. Pictures: David Cuche, Diego Ovejero, Herbert Posch, Fabio Bettini et al.